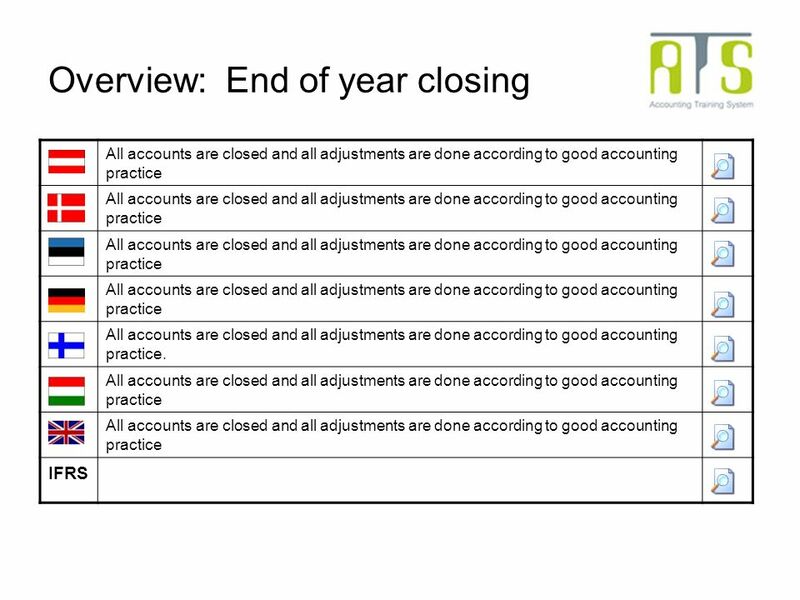 Differences in accounting Topic: End of year closing. 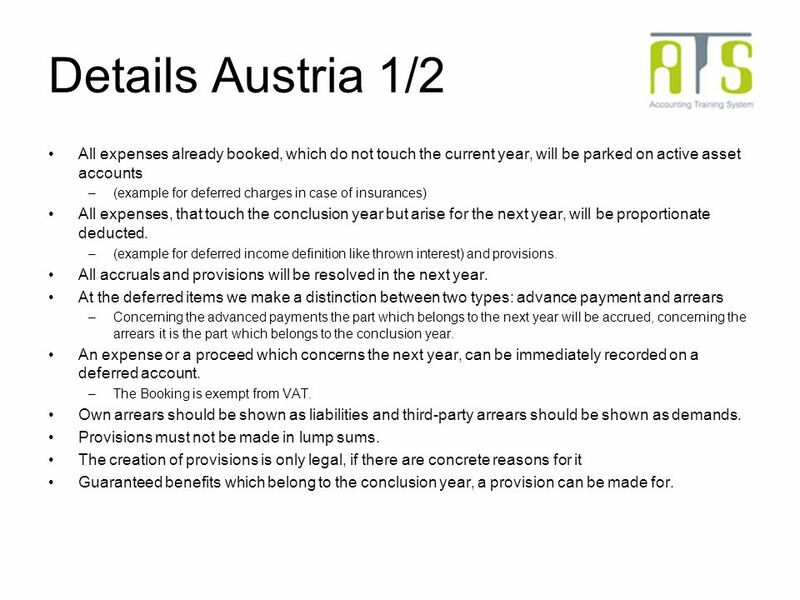 3 Details Austria 1/2 All expenses already booked, which do not touch the current year, will be parked on active asset accounts –(example for deferred charges in case of insurances) All expenses, that touch the conclusion year but arise for the next year, will be proportionate deducted. –(example for deferred income definition like thrown interest) and provisions. All accruals and provisions will be resolved in the next year. At the deferred items we make a distinction between two types: advance payment and arrears –Concerning the advanced payments the part which belongs to the next year will be accrued, concerning the arrears it is the part which belongs to the conclusion year. An expense or a proceed which concerns the next year, can be immediately recorded on a deferred account. –The Booking is exempt from VAT. Own arrears should be shown as liabilities and third-party arrears should be shown as demands. Provisions must not be made in lump sums. The creation of provisions is only legal, if there are concrete reasons for it Guaranteed benefits which belong to the conclusion year, a provision can be made for. 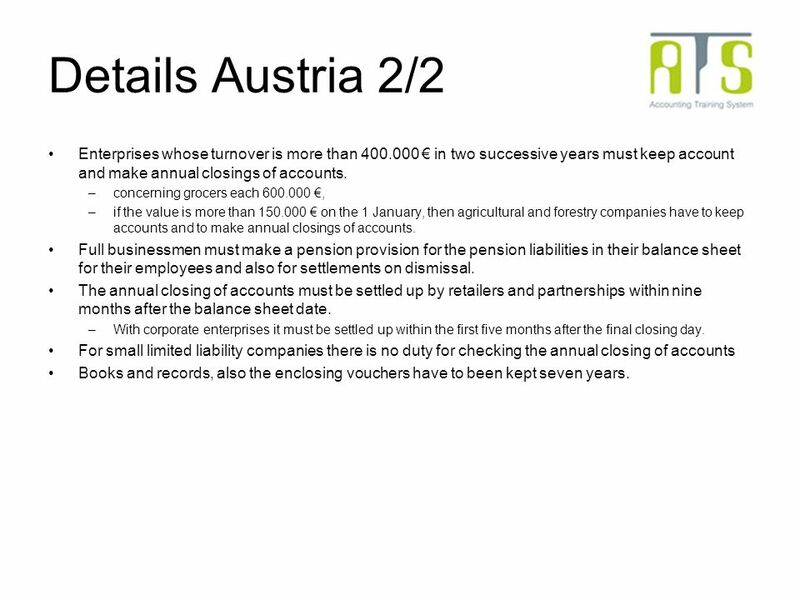 4 Details Austria 2/2 Enterprises whose turnover is more than 400.000 in two successive years must keep account and make annual closings of accounts. –concerning grocers each 600.000, –if the value is more than 150.000 on the 1 January, then agricultural and forestry companies have to keep accounts and to make annual closings of accounts. Full businessmen must make a pension provision for the pension liabilities in their balance sheet for their employees and also for settlements on dismissal. The annual closing of accounts must be settled up by retailers and partnerships within nine months after the balance sheet date. –With corporate enterprises it must be settled up within the first five months after the final closing day. For small limited liability companies there is no duty for checking the annual closing of accounts Books and records, also the enclosing vouchers have to been kept seven years. 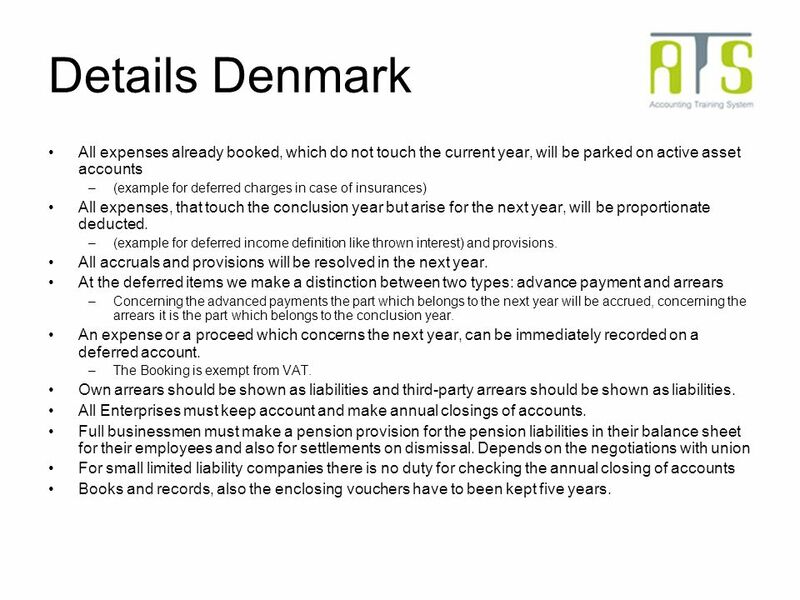 5 Details Denmark All expenses already booked, which do not touch the current year, will be parked on active asset accounts –(example for deferred charges in case of insurances) All expenses, that touch the conclusion year but arise for the next year, will be proportionate deducted. –(example for deferred income definition like thrown interest) and provisions. All accruals and provisions will be resolved in the next year. At the deferred items we make a distinction between two types: advance payment and arrears –Concerning the advanced payments the part which belongs to the next year will be accrued, concerning the arrears it is the part which belongs to the conclusion year. An expense or a proceed which concerns the next year, can be immediately recorded on a deferred account. –The Booking is exempt from VAT. Own arrears should be shown as liabilities and third-party arrears should be shown as liabilities. All Enterprises must keep account and make annual closings of accounts. Full businessmen must make a pension provision for the pension liabilities in their balance sheet for their employees and also for settlements on dismissal. Depends on the negotiations with union For small limited liability companies there is no duty for checking the annual closing of accounts Books and records, also the enclosing vouchers have to been kept five years. 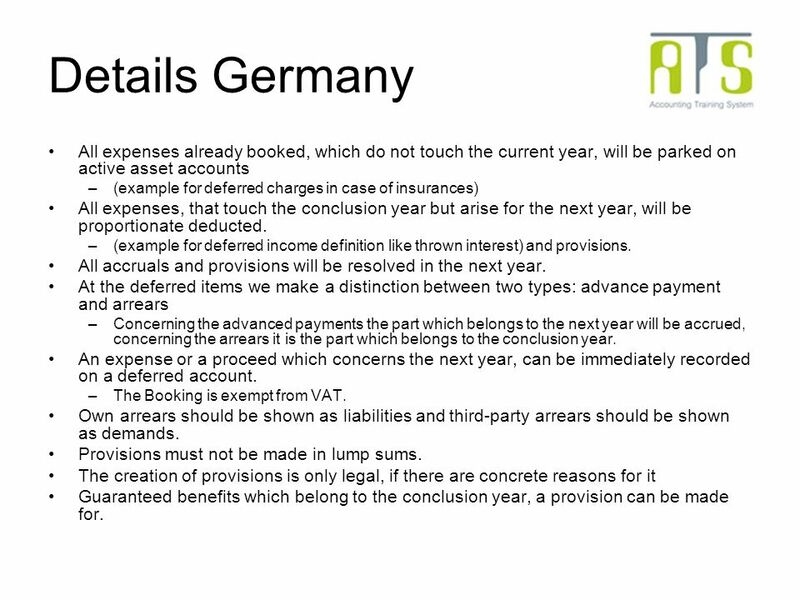 6 Details Germany All expenses already booked, which do not touch the current year, will be parked on active asset accounts –(example for deferred charges in case of insurances) All expenses, that touch the conclusion year but arise for the next year, will be proportionate deducted. –(example for deferred income definition like thrown interest) and provisions. All accruals and provisions will be resolved in the next year. At the deferred items we make a distinction between two types: advance payment and arrears –Concerning the advanced payments the part which belongs to the next year will be accrued, concerning the arrears it is the part which belongs to the conclusion year. An expense or a proceed which concerns the next year, can be immediately recorded on a deferred account. –The Booking is exempt from VAT. Own arrears should be shown as liabilities and third-party arrears should be shown as demands. Provisions must not be made in lump sums. The creation of provisions is only legal, if there are concrete reasons for it Guaranteed benefits which belong to the conclusion year, a provision can be made for. 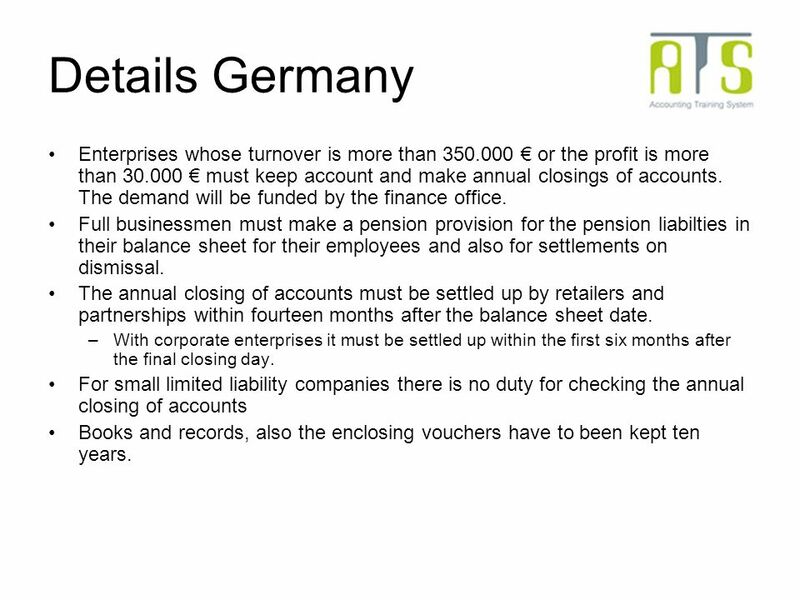 7 Details Germany Enterprises whose turnover is more than 350.000 or the profit is more than 30.000 must keep account and make annual closings of accounts. The demand will be funded by the finance office. Full businessmen must make a pension provision for the pension liabilties in their balance sheet for their employees and also for settlements on dismissal. The annual closing of accounts must be settled up by retailers and partnerships within fourteen months after the balance sheet date. –With corporate enterprises it must be settled up within the first six months after the final closing day. For small limited liability companies there is no duty for checking the annual closing of accounts Books and records, also the enclosing vouchers have to been kept ten years. 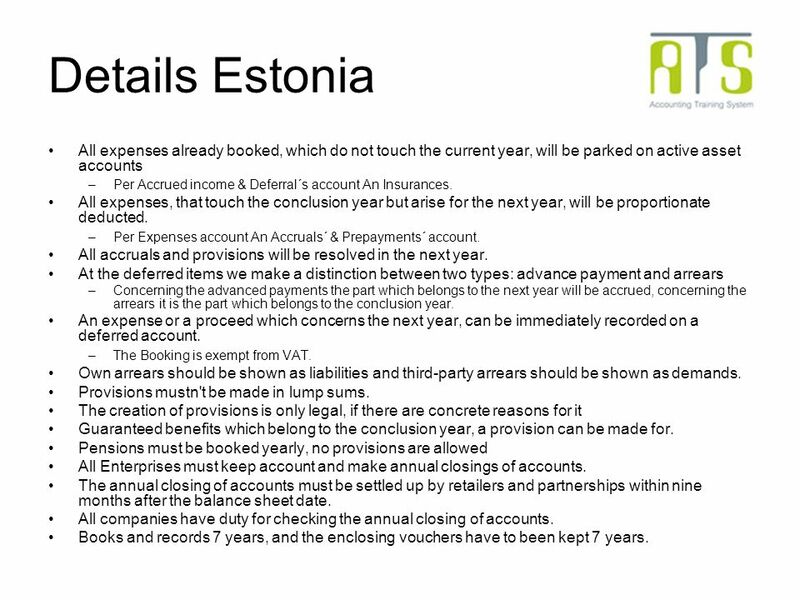 8 Details Estonia All expenses already booked, which do not touch the current year, will be parked on active asset accounts –Per Accrued income & Deferral´s account An Insurances. All expenses, that touch the conclusion year but arise for the next year, will be proportionate deducted. –Per Expenses account An Accruals´ & Prepayments´ account. All accruals and provisions will be resolved in the next year. At the deferred items we make a distinction between two types: advance payment and arrears –Concerning the advanced payments the part which belongs to the next year will be accrued, concerning the arrears it is the part which belongs to the conclusion year. An expense or a proceed which concerns the next year, can be immediately recorded on a deferred account. –The Booking is exempt from VAT. Own arrears should be shown as liabilities and third-party arrears should be shown as demands. Provisions mustn't be made in lump sums. The creation of provisions is only legal, if there are concrete reasons for it Guaranteed benefits which belong to the conclusion year, a provision can be made for. Pensions must be booked yearly, no provisions are allowed All Enterprises must keep account and make annual closings of accounts. The annual closing of accounts must be settled up by retailers and partnerships within nine months after the balance sheet date. All companies have duty for checking the annual closing of accounts. Books and records 7 years, and the enclosing vouchers have to been kept 7 years. 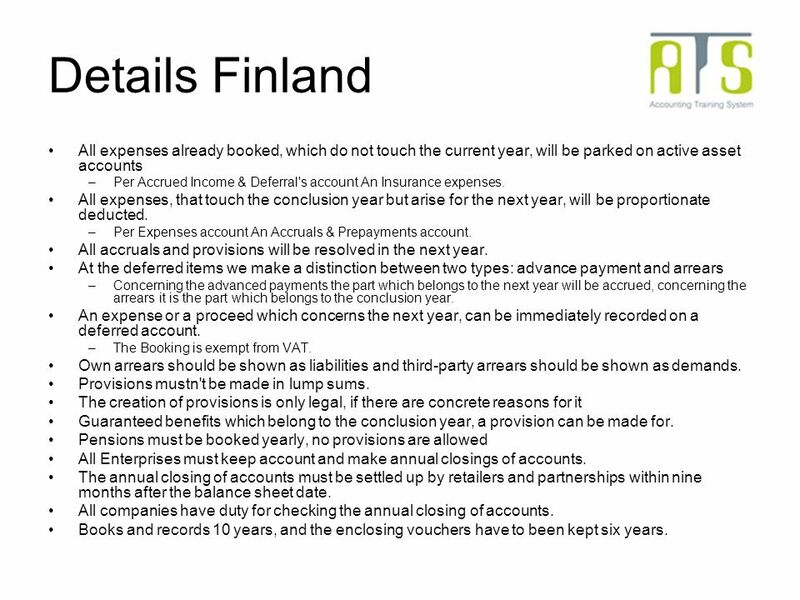 9 Details Finland All expenses already booked, which do not touch the current year, will be parked on active asset accounts –Per Accrued Income & Deferral's account An Insurance expenses. All expenses, that touch the conclusion year but arise for the next year, will be proportionate deducted. –Per Expenses account An Accruals & Prepayments account. All accruals and provisions will be resolved in the next year. At the deferred items we make a distinction between two types: advance payment and arrears –Concerning the advanced payments the part which belongs to the next year will be accrued, concerning the arrears it is the part which belongs to the conclusion year. An expense or a proceed which concerns the next year, can be immediately recorded on a deferred account. –The Booking is exempt from VAT. Own arrears should be shown as liabilities and third-party arrears should be shown as demands. Provisions mustn't be made in lump sums. The creation of provisions is only legal, if there are concrete reasons for it Guaranteed benefits which belong to the conclusion year, a provision can be made for. Pensions must be booked yearly, no provisions are allowed All Enterprises must keep account and make annual closings of accounts. The annual closing of accounts must be settled up by retailers and partnerships within nine months after the balance sheet date. All companies have duty for checking the annual closing of accounts. Books and records 10 years, and the enclosing vouchers have to been kept six years. 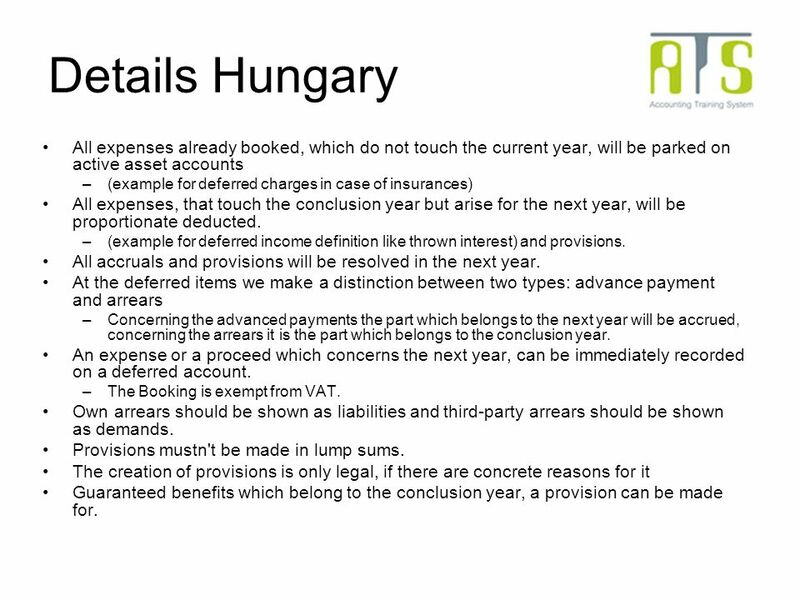 10 Details Hungary All expenses already booked, which do not touch the current year, will be parked on active asset accounts –(example for deferred charges in case of insurances) All expenses, that touch the conclusion year but arise for the next year, will be proportionate deducted. –(example for deferred income definition like thrown interest) and provisions. All accruals and provisions will be resolved in the next year. At the deferred items we make a distinction between two types: advance payment and arrears –Concerning the advanced payments the part which belongs to the next year will be accrued, concerning the arrears it is the part which belongs to the conclusion year. An expense or a proceed which concerns the next year, can be immediately recorded on a deferred account. –The Booking is exempt from VAT. Own arrears should be shown as liabilities and third-party arrears should be shown as demands. Provisions mustn't be made in lump sums. The creation of provisions is only legal, if there are concrete reasons for it Guaranteed benefits which belong to the conclusion year, a provision can be made for. 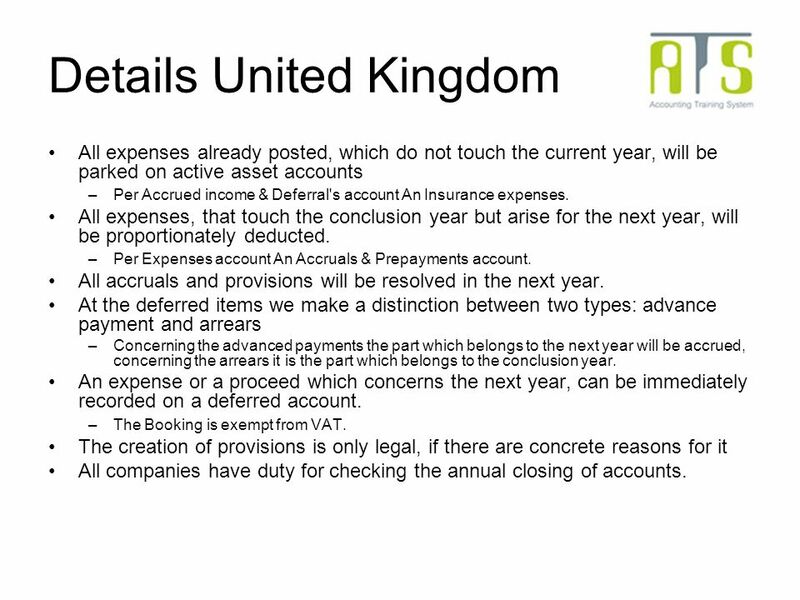 11 Details United Kingdom All expenses already posted, which do not touch the current year, will be parked on active asset accounts –Per Accrued income & Deferral's account An Insurance expenses. All expenses, that touch the conclusion year but arise for the next year, will be proportionately deducted. –Per Expenses account An Accruals & Prepayments account. All accruals and provisions will be resolved in the next year. At the deferred items we make a distinction between two types: advance payment and arrears –Concerning the advanced payments the part which belongs to the next year will be accrued, concerning the arrears it is the part which belongs to the conclusion year. An expense or a proceed which concerns the next year, can be immediately recorded on a deferred account. –The Booking is exempt from VAT. The creation of provisions is only legal, if there are concrete reasons for it All companies have duty for checking the annual closing of accounts. 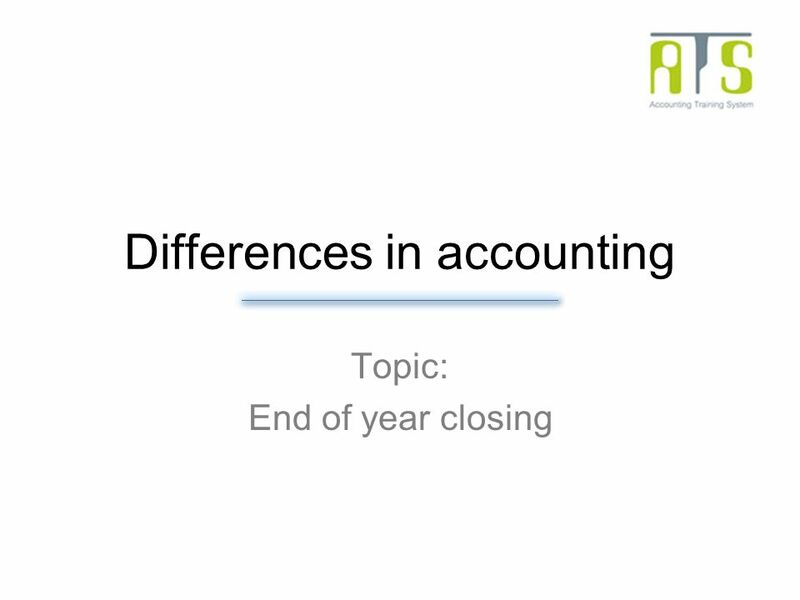 Download ppt "Differences in accounting Topic: End of year closing." 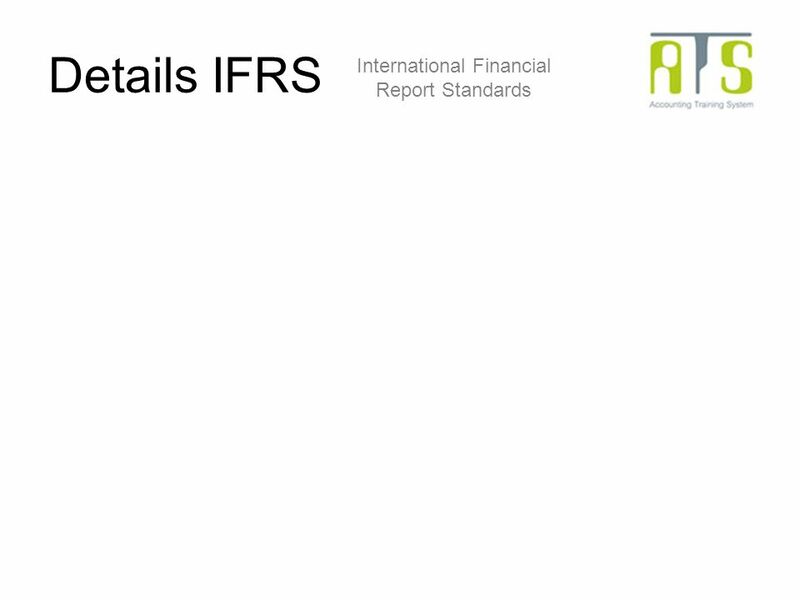 IFRS for Liabilities David Cairns. © 2006 David Cairns Liabilities and the IASB Framework Application to: –provisions –employer accounting. Chapter 9 P9-4 Pg. 503 JeffWilsonAnnieSarah. Question During 2007, Riverside Company completed the following two transactions. The annual accounting period. McGraw-Hill/Irwin Copyright © 2010 by The McGraw-Hill Companies, Inc. All rights reserved. The Accounting Cycle: Accruals and Deferrals Chapter 4. © The McGraw-Hill Companies, Inc., 2008 McGraw-Hill/Irwin 4-1 The Accounting Cycle Accruals and Deferrals Chapter 4. © The McGraw-Hill Companies, Inc., 2008 McGraw-Hill/Irwin The Accounting Cycle Accruals and Deferrals Chapter 4. McGraw-Hill/Irwin Copyright © 2006 by The McGraw-Hill Companies, Inc. All rights reserved. 4-1 Chapter Four: The Accounting Cycle: Accruals and Deferrals. Accruals and Prepayments. Accruals and prepayments Before we prepare the final accounts of a business it is often necessary to adjust the figures in the. FINANCIAL MANAGEMENT GUIDE © Marin Management, Inc General Accounting Procedures, 7172 Accrual of Prepaid Expenses A. The Purpose of This Policy. LIABILITIES. Mugan-Akman Liabilities obligations of an entity to make a future payment or to deliver goods or services to the third parties in the. Chapter 8  Current Liabilities. Chapter 8Mugan-Akman Liabilities obligations of an entity to make a future payment or to deliver goods or services.